Potassium is an element like oxygen and carbon and like those other elements it is essential for life. Potassium is an element but we also refer to it as an electrolyte because it is important for the conduction of electrical signals through nerve and muscle. When a signal is sent down a nerve cell it is conducted across the cells outer membrane when potassium channels open allowing a current to flow. When a muscle contracts it also uses potassium channels. Why is the potassium level important? If your potassium level is too high or too low the potassium channels will not work properly. The muscle cells may not contract or may contract when we don't want them to. This can result in muscle weakness, muscle spasms, or in the case of the heart muscle it can cause an irregular heart beat. in severe cases it can even cause the heart to stop beating. What should I do if my potassium level is abnormal? Potassium levels can either be too high or too low for a number of reasons and therefor the treatment will be different depending on what the reason is. Whenever possible the reason for the abnormality should be determined first so the best treatment can be determined. One of the most common reasons that a patient may have low potassium is medications. Diuretics are among the most frequent drugs known to cause low potassium levels but patients on diuretics should never take potassium supplements without their doctors advice since some diuretics can have the opposite effect on potassium. Patients who decide to take potassium on their own could cause potassium levels to rise dangerously high. Below is a list of some of the some of the things that can decrease potassium levels. Consumption of large amounts of real licorice or herbal teas containing glycyrrhetinic acid ( no longer made in the USA). Artificial licorice like "Twizzlers" will not affect potassium levels. There are many possible reasons for an elevated potassium level. Some are very rare and others extremely common. Below is a list of some of the causes. Technical problems - One of the most common reasons that the lab may report a high potassium level has little to do with the patient at all. The most common cause is a false reading that results from the rupture of blood cells in the blood sample. When we measure potassium levels what we are attempting to measure is the concentration of potassium in the serum. Blood is made of two basic components, serum and blood cells. Serum is the fluid that the cells float in. Without the serum the blood cells would be a solid clump and could not flow through the blood vessels. The concentration of potassium in the serum is what we are concerned about because its only the serum concentration that affects your muscles and heart. Red Blood cells have potassium in them too but the concentration is much higher in the red blood cells than it is in the serum. Because of this, anything that causes the red blood cells to rupture and leak their potassium into the serum prior to testing will artificially elevate the reading we get. Many things can cause red blood cells to rupture. Some people simply have more fragile red cells. Fragile blood cells do not cause any health problems but they can rupture more easily during blood collection resulting in artificially elevated potassium levels. Thin needles cause less pain when blood is taken so they are preferred, but in some patients the thinner needle is more likely to damage the red cell as it rushes through the narrow opening. Tourniquets make blood vessels easier to find and are therefor very helpful when trying to draw blood, however using a tourniquet can increase the chances of rupturing the cells. It is often difficult to draw blood without a tourniquet but if a patient's potassium levels are high we often try to draw repeat samples without a tourniquet to see if it makes a difference. Blood that is allowed to sit too long before it is spun down in the centrifuge can allow ruptured cells to come in contact with serum and elevate potassium levels. After blood is collected it is put into a centrifuge which spins very fast. The heavier blood cells sink to the bottom while the lighter plasma floats to the top. 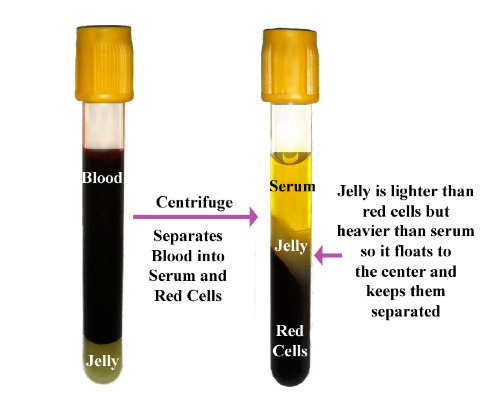 The tube contains some gelatin which is lighter than red cells but heavier than plasma. This gelatin moves between the red cells and the plasma when the tube is in the centrifuge and keeps them apart. For this to work the blood has to be given time to clot before its put in the centrifuge but if it sits for too long before being spun down the red cells may rupture before they are separated from the plasma. Spin the sample too soon and the cells wont separate. Wait too long and the cells break open. The tricky thing is that the amount of time that is too soon and too long can vary from patient to patient.